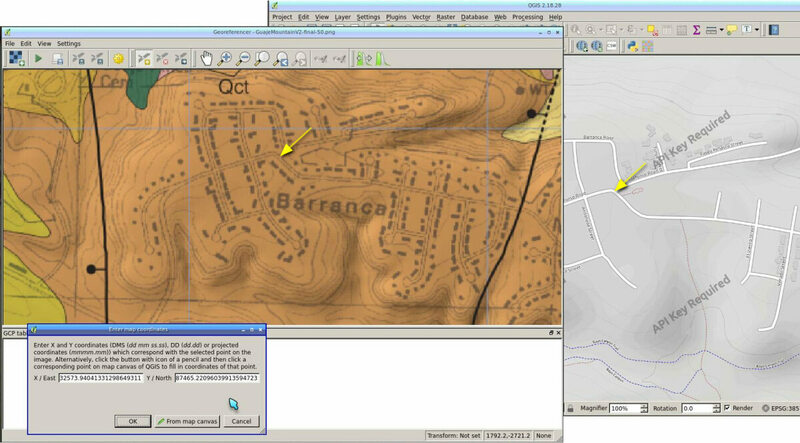 I recently wrote about Translating track files between mapping formats like GPX, KML, KMZ and UTM But there's one common mapping format that keeps coming up that's hard to handle using free software, and tricky to translate to other formats: ESRI shapefiles. ArcGIS shapefiles are crazy. 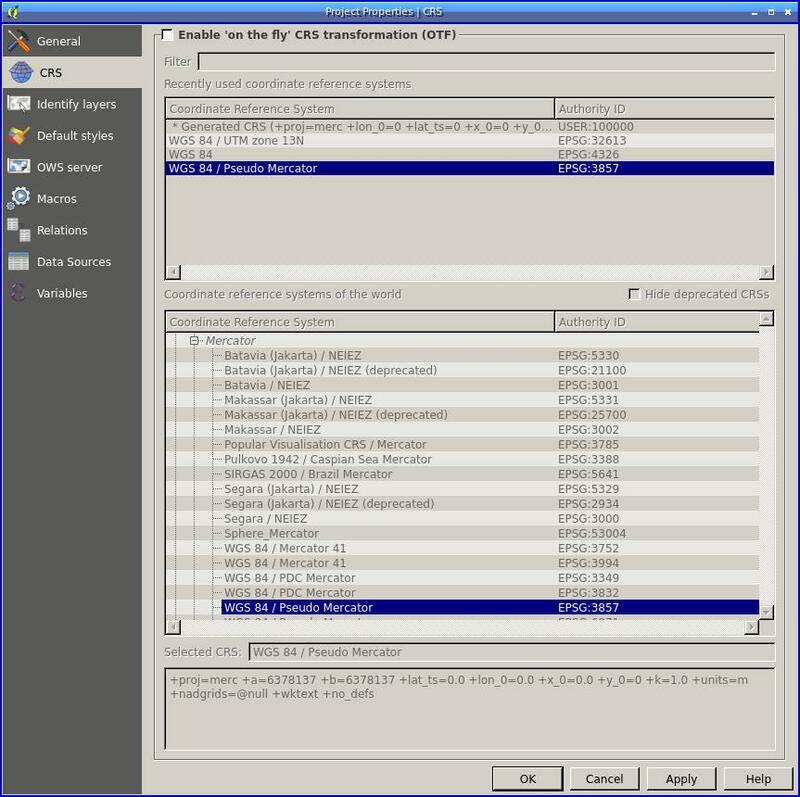 Typically they come as an archive that includes many different files, with the same base name but different extensions: filename.sbn, filename.shx, filename.cpg, filename.sbx, filename.dbf, filename.shp, filename.prj, and so forth. Which of these are important and which aren't? To be honest, I don't know. 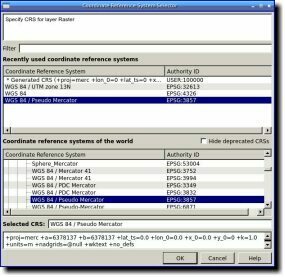 I found this description in my searches: "A shape file map consists of the geometry (.shp), the spatial index (.shx), the attribute table (.dbf) and the projection metadata file (.prj)." Poking around, I found that most of the interesting metadata (trail name, description, type, access restrictions and so on) was in the .dbf file. Unfortunately, most of the metadata -- comments on trail conditions and access restrictions that were in the .dbf file -- didn't make it into the KML. GPX was even worse. 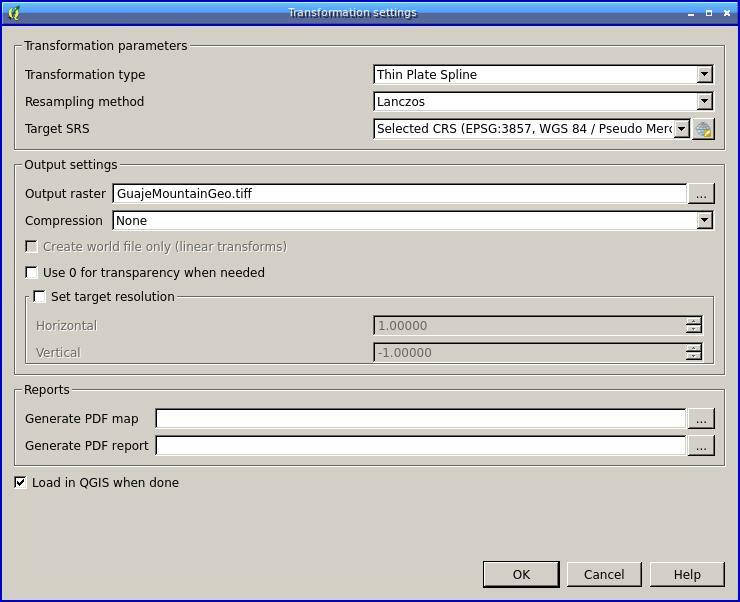 ogr2ogr knows how to convert directly to GPX, but that printed a lot of errors like "Field of name 'foo' is not supported in GPX schema. 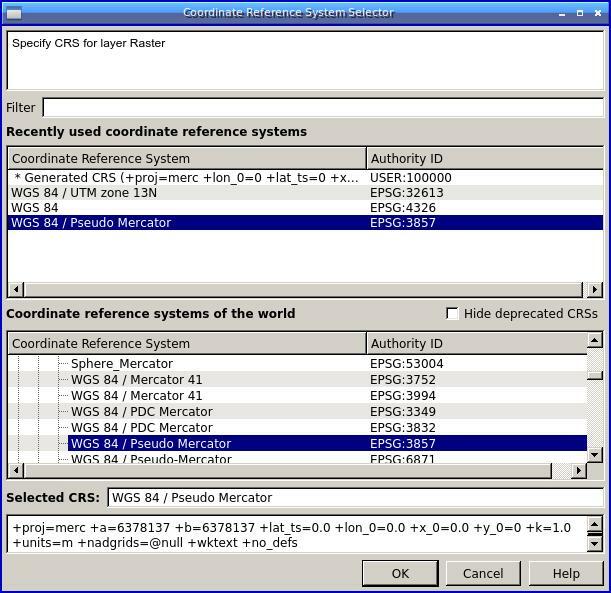 Use GPX_USE_EXTENSIONS creation option to allow use of the <extensions> element." So I tried ogr2ogr -f "GPX" -dsco GPX_USE_EXTENSIONS=YES output.gpx input.shp but that just led to more errors. It did produce a GPX file, but it had almost no useful data in it, far less than the KML did. I got a better GPX file by using ogr2ogr to convert to KML, then using gpsbabel to convert that KML to GPX. But there is a better way: GeoJSON. But JSON is a nice straightforward format, easy to read and easy to parse, and it took surprisingly little work to add GeoJSON parsing to PyTopo. Now, at least, I have a way to view the maps converted from shapefiles, click on a trail and see the metadata from the original shapefile. Part II: Making New Map Tracks with Google Earth. A few days ago I wrote about track files in maps, specifically Translating track files between mapping formats. I promised to follow up with information on how to create new tracks. For instance, I have some scans of old maps from the 60s and 70s showing the trails in the local neighborhood. There's no newer version. (In many cases, the trails have disappeared from lack of use -- no one knows where they're supposed to be even though they're legally trails where you're allowed to walk.) I wanted a way to turn trails from the old map into GPX tracks. My first thought was to trace the old PDF map. A lot of web searching found a grand total of one page that talks about that: How to convert image of map into vector format?. It involves using GIMP to make an image containing just black lines on a white background, saving as uncompressed TIFF, then using a series of commands in GRASS. I made a start on that, but it was looking like it might be a big job that way. Since a lot of the old trails are still visible as faint traces in satellite photos, I decided to investigate tracing satellite photos in a map editor first, before trying the GRASS method. The only open source map editor I've found is called Viking, and it's terrible. The user interface is complicated and poorly documented, and I could input only two or three trail segments before it crashed and I had to restart. Saving often, I did build up part of the trail network that way, but it was so slow and tedious restoring between crashes that I gave up. OpenStreetMap has several editors available, and some of them are quite good, but they're (quite understandably) oriented toward defining roads that you're going to upload to the OpenStreetMap world map. I do that for real trails that I've walked myself, but it doesn't seem appropriate for historical paths between houses, some of which are now fenced off and few of which I've actually tried walking yet. Click on "My Places" in the sidebar before starting, assuming you'll want to keep these tracks around. Right-click on My Places and choose Add->Folder if you're going to be creating more than one path. That way you can have a single KML file (Google Earth creates KML/KMZ, not GPX) with all your tracks together. Move and zoom the map to where you can see the starting point for your path. Click the "Add Path" button in the toolbar. This brings up a dialog where you can name the path and choose a color that will stand out against the map. Do not hit Return after typing the name -- that will immediately dismiss the dialog and take you out of path editing mode, leaving you with an empty named object in your sidebar. If you forget, like I kept doing, you'll have to right-click it and choose Properties to get back into editing mode. Iconify, shade or do whatever your window manager allows to get that large, intrusive dialog out of the way of the map you're trying to edit. Shade worked well for me in Openbox. Click on the starting point for your path. If you forgot to move the map so that this point is visible, you're out of luck: there's no way I've found to move the map at this point. (You might expect something like dragging with the middle mouse button, but you'd be wrong.) Do not in any circumstances be tempted to drag with the left button to move the map: this will draw lots of path points. If you added points you don't want -- for instance, if you dragged on the map trying to move it -- Ctrl-Z doesn't undo, and there's no Undo in the menus, but Delete removes previous points. Whew. Once you've started adding points, you can move the map using the arrow keys on your keyboard. And you can always zoom with the mousewheel. When you finish one path, click OK in its properties dialog to end it. Save periodically: click on the folder you created in My Places and choose Save Place As... Google Earth is a lot less crashy than Viking, but I have seen crashes. When you're done for the day, be sure to File->Save->Save My Places. Google Earth apparently doesn't do this automatically; I was forever being confused why it didn't remember things I had done, and why every time I started it it would give me syntax errors on My Places saying it was about to correct the problem, then the next time I'd get the exact same error. Save My Places finally fixed that, so I guess it's something we're expected to do now and then in Google Earth. Once I'd learned those tricks, the map-making went fairly quickly. I had intended only to trace a few trails then stop for the night, but when I realized I was more than halfway through I decided to push through, and ended up with a nice set of KML tracks which I converted to GPX and loaded onto my phone. Now I'm ready to explore. I use map tracks quite a bit. 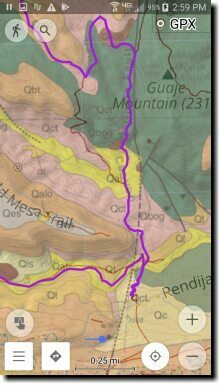 On my Android phone, I use OsmAnd, an excellent open-source mapping tool that can download map data generated from free OpenStreetMap, then display the maps offline, so I can use them in places where there's no cellphone signal (like nearly any hiking trail). 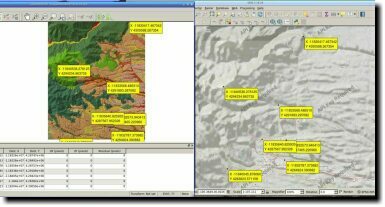 At my computer, I never found a decent open-source mapping program, so I wrote my own, PyTopo, which downloads tiles from OpenStreetMap. 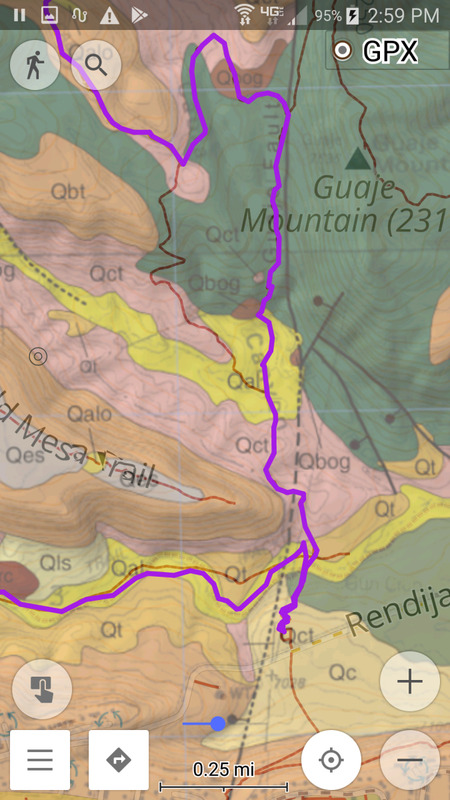 In OsmAnd, I record tracks from all my hikes, upload the GPX files, and view them in PyTopo. But it's nice to go the other way, too, and take tracks or waypoints from other people or from the web and view them in my own mapping programs, or use them to find them when hiking. 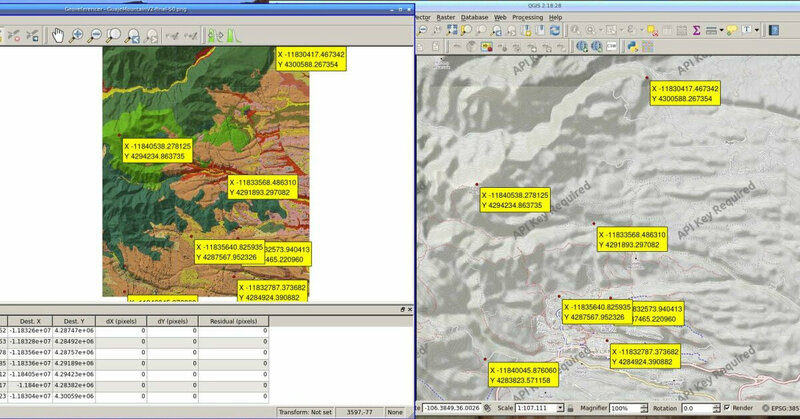 Both OsmAnd and PyTopo can show Garmin track files in the GPX format. 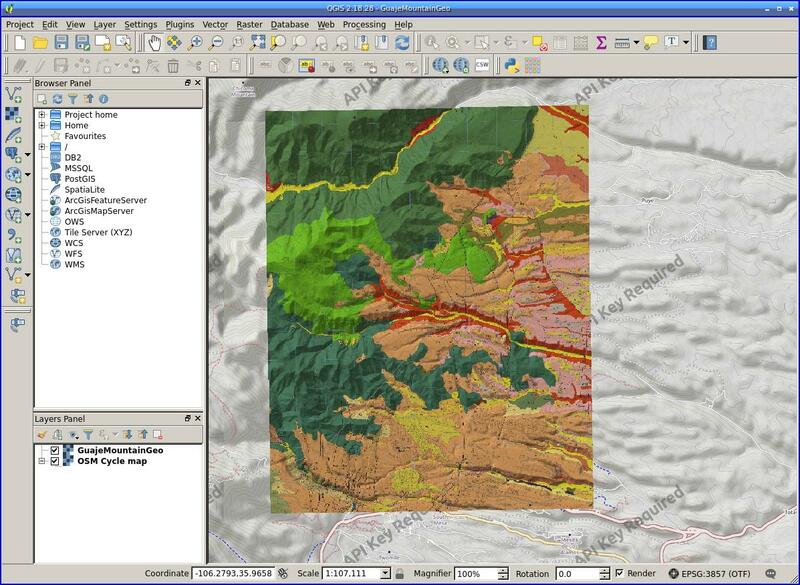 PyTopo can also show KML and KMZ files, Google's more complicated mapping format, but OsmAnd can't. 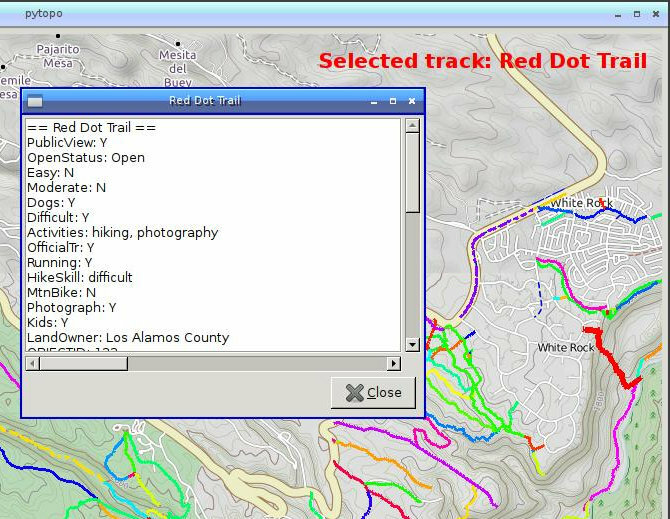 A lot of track files are distributed in Google formats, and I find I have to translate them fairly often -- for instance, lists of trails or lists of waypoints on a new hike I plan to do may be distributed as KML or KMZ. so I can just type kml2gpx file.kml and it will create a file.gpx for me. Of course, if you ever have a need to go from GPX to KML, you can reverse the gpsbabel arguments appropriately; and if you need KMZ, run gzip afterward. A couple of people I know use a different format, called UTM, which stands for Universal Transverse Mercator, for waypoints, and there are some secret lists of interesting local features passed around in that format. It's a strange system. Instead of using latitude and longitude like most world mapping coordinate systems, UTM breaks the world into 60 longitudinal zones. UTM coordinates don't usually specify their zone (at least, none of the ones I've been given ever have), so if someone gives you a UTM coordinate, you need to know what zone you're in before you can translate it to a latitude and longitude. Then a pair of UTM coordinates specifies easting, and northing which tells you where you are inside the zone. Wikipedia has a map of UTM zones. I (and all the UTM coordinates I've had to deal with) are in zone 13, so that's what I used for that example and I hardwired that into my alias, but if you're near a zone boundary, you'll need to figure out which zone to use for each coordinate. I also know someone who tends to send me single UTM coordinate pairs, because that's what she has her Garmin configured to show her. For instance, "We'll be using the trailhead at 0395145 3966291". This happened often enough, and I got tired of looking up the UTM UniCSV format every time, that I made another shell function just for that. So I can say utm2gpx 0395145 3966291, pasting the two coordinates from her email, and get a nice GPX file that I can push to my phone. What if all you have is a printed map, or a scan of an old map from the pre-digital days? That's part 2, which I'll post in a few days. A few days ago I wrote about how I use making waypoint files for a list of house addresses is OsmAnd. For waypoint files, you need latitude/longitude coordinates, and I was getting those from a web page that used the online Google Maps API to convert an address into latitude and longitude coordinates. It was pretty cool at first, but pasting every address into the latitude/longitude web page and then pasting the resulting coordinates into the address file, got old, fast. That's exactly the sort of repetitive task that computers are supposed to handle for us. And then I discovered the Python googlemaps package. Exactly what I needed! It's in the Python Package Index, so I installed it with pip install googlemaps. That enabled me to change my waymaker Python script: if the first line of a description wasn't a latitude and longitude, instead it looked for something that might be an address. But first I needed to check whether the first line of the entry was already latitude/longitude coordinates, since I'd already converted some of my files. That uses another regular expression. Python doesn't seem to have a built-in way to search for generic numeric expressions (containing digits, decimal points or +/- symbols) so I made one, since I had to use it twice if I was searching for two numbers with whitespace between them. Overall, a nice simple solution made possible with python-googlemaps. The full script is on github: waymaker. Dave and I have been doing some exploratory househunting trips, and one of the challenges is how to maintain a list of houses and navigate from location to location. It's basically like geocaching, navigating from one known location to the next. Sure, there are smartphone apps to do things like "show houses for sale near here" against a Google Maps background. But we didn't want everything, just the few gems we'd picked out ahead of time. And some of the places we're looking are fairly remote -- you can't always count on a consistent signal everywhere as you drive around, let alone a connection fast enough to download map tiles. Fortunately, I use a wonderful open-source Android program called OsmAnd. It's the best, bar none, at offline mapping: download data files prepared from OpenStreetMap vector data, and you're good to go, even into remote areas with no network connectivity. It's saved our butts more than once exploring remote dirt tracks in the Mojave. And since the maps come from OpenStreetMap, if you find anything wrong with the map, you can fix it. So the map part is taken care of. What about that list of houses? On the other hand, one of OsmAnd's many cool features is that it can show track logs. I can upload a GPX file from my Garmin, or record a track within OsmAnd, and display the track on OsmAnd's map. GPX track files can include waypoints. What if I made a GPX file consisting only of waypoints and descriptions for each house? So I just needed to turn those into GPX. GPX is a fairly straightforward XML format -- I've parsed GPX files for pytopo and for ellie, and generating them from Python should be easier than parsing. But first I needed latitude and longitude coordinates. A quick web search solved that: an excellent page called Find latitude and longitude with Google Maps. You paste the address in and it shows you the location on a map along with latitude and longitude. Thanks to Bernard Vatant at Mondeca! Then I wrote a script called waymaker that parses a file of coordinates and descriptions and makes waypoint files. 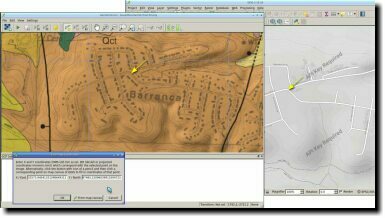 Run it like this: waymaker infile.txt outfile.gpx and it will create (or overwrite) a gpx file consisting of those waypoints. I plugged my Android device into my computer's USB port, mounted it as usb-storage and copied all the GPX files into osmand/tracks (I had to create the tracks subdirectory myself, since I hadn't recorded any tracks. After restarting OsmAnd, it was able to see all the waypoint files. OsmAnd has a couple of other ways of showing points besides track files. "Favorites" lets you mark a point on the map and save it to various Favorites categories. But although there's a file named favorites.gpx, changes you make to it never show up in the program. Apparently they're cached somewhere else. "POI" (short for Points of Interest) can be uploaded, but only as a .obf OsmAnd file or a .sqlitedb database, and there isn't much documentation on how to create either one. GPX tracks seemed like the easiest solution, and I've been happy with them so far. Update: I asked on the osmand mailing list; it turns out that on the Favorites screen (Define View, then Favorites) there's a Refresh button that makes osmand re-read favorites.gpx. Works great. It uses pretty much the same format as track files -- I took <wpt></wpt> sequences I'd generated with waymaker and added them to my existing favorites.gpx file, adding appropriate categories. It's nice to have two different ways to display and categorize waypoints within the app. How do you view these waypoints once they're loaded? When you're in OsmAnd's map view, tap the menu button and choose Define View, then GPX track... You'll see a list of all your GPX files; choose the one you want. You'll be taken back to the map view, at a location and zoom level that shows all your waypoints. Don't panic if you don't see them immediately; sometimes I needed to scroll and zoom around a little before OsmAnd noticed there were waypoints and started drawing them. Then you can navigate in the usual way. When you get to a waypoint, tap on it to see the description brieftly -- I was happy to find that multiple line descriptions work just fine. Or long-press on it to pop up a persistent description window that will stay up until you dismiss it. It worked beautifully for our trip, both for houses and for other things like motels and points of interest along the way. A new trail opened up above Alum Rock park! Actually a whole new open space preserve, called Sierra Vista -- with an extensive set of trails that go all sorts of interesting places. Dave and I visit Alum Rock frequently -- we were married there -- so having so much new trail mileage is exciting. We tried to explore it on foot, but quickly realized the mileage was more suited to mountain bikes. Even with bikes, we'll be exploring this area for a while (mostly due to not having biked in far too long, so it'll take us a while to work up to that much riding ... a combination of health problems and family issues have conspired to keep us off the bikes). Of course, part of the fun of discovering a new trail system is poring over maps trying to figure out where the trails will take us, then taking GPS track logs to study later to see where we actually went. And as usual when uploading GPS track logs and viewing them in pytopo, I found some things that weren't working quite the way I wanted, so the session ended up being less about studying maps and more about hacking Python. In the end, I fixed quite a few little bugs, improved some features, and got saved sites with saved zoom levels working far better. 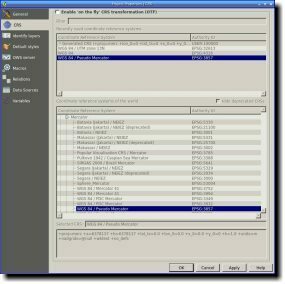 Now, PyTopo 1.0 happened quite a while ago -- but there were two of us hacking madly on it at the time, and pinning down the exact time when it should be called 1.0 wasn't easy. In fact, we never actually did it. I know that sounds silly -- of all releases to not get around to, finally reaching 1.0? Nevertheless, that's what happened. I thought about cheating and calling this one 1.0, but we've had 1.0 beta RPMs floating around for so long (and for a much earlier release) that that didn't seem right. 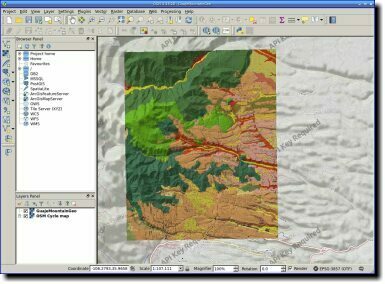 So I've called the new release PyTopo 1.1. It seems to be working pretty solidly. It's certainly been very helpful to me in exploring the new trails. It's great for cross-checking with Google Earth: the OpenCycleMap database has much better trail data than Google does, and pytopo has easy track log loading and will work offline, while Google has the 3-D projection aerial imagery that shows where trails and roads were historically (which may or may not correspond to where they decide to put the new trails). It's great to have both. Anyway, here's the new PyTopo.